Scottish- born painter Catriona Herd splits her time between New York and the UK. 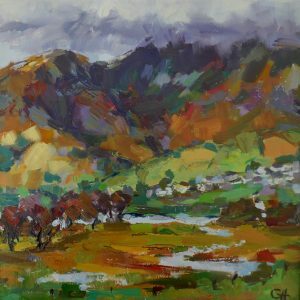 Catriona has staged successful solo exhibitions in Manhattan, Brooklyn, Edinburgh, Frankfurt and Woodstock, Oxfordshire. Catriona travels throughout the UK and all over mainland Europe making plein air sketches in pastel and watercolour. She is inspired by light, atmosphere and structure in the landscape and especially by colour. 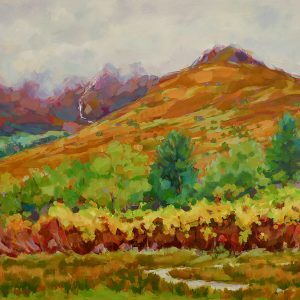 A misty, rainy day might seem neutral in colour but Catriona says she will see ‘blues, greens, ochres and purples…… a complex pattern of colour.’ Hence the need for extensive plein air sketches. 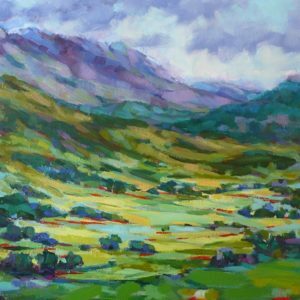 Her process back in the studio involves more studies in pastel and oil paint, trying to capture the rhythm and composition, before beginning a large oil painting. Catriona gained a post graduate qualification at Duncan of Jordanstone College of Art. 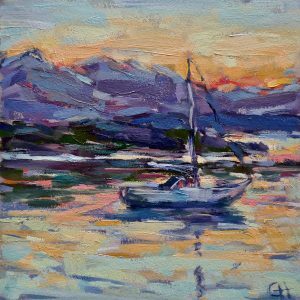 More recently she attended the Art Student’s League in New York, where she won a scholarship to Anderson Ranch Arts Center in Colorado and a six week scholarship to study and paint at the Marchutz School in Aix-en -Provence.